But that’s not how our sport is often marketed. I think we’ve had an unhealthy focus on a small corner of the sport when we should be shining a spotlight on the entire community. The World Rankings and its underlying “Race Index” formula have been as guilty as anyone for doing that. That’s why we’re evolving the influential Race Index into a new system that better supports the events that support our sport. Starting this season, races will not only be scored on elite participation (the traditional Race Index formula) but also mass participation, junior participation and the quality of an event in general. Hopefully this will make the World Rankings more open to more paddlers while recognising, rewarding and promoting the events that truly help grow our sport. Don’t get me wrong: I think elite SUP racing is freakin’ awesome — our incredible elite athletes deserve to be promoted and celebrated. But that small part of our sport shouldn’t become detached from the “middle class” that make up the vast majority of our community. We’re not Formula 1. We’re not pro surfing. We’re stand up paddling–we’re an inclusive sport and therefore we should be an open sport. The weekend warriors, the juniors, the masters. They’re all as much a part of this sport as anyone else. Elite events are fun to watch and add some great storylines, but grassroots, mass participation races are just as important (if not more so). The cancellation of the Pacific Paddle Games this week was an unfortunate but symbolic reminder. That event suffered a steep decline in amateur participation — the reasons why aren’t so important right now, but the undeniable fact is the PPGs became less sustainable after the focus drifted away from the open paddlers. I wrote about how the Race Index works the other day, but the short version is that it’s a ranking of every event in the world based purely on the elite level of competition. While I’m proud of the algorithm I created six years ago and the influence it’s had, I also think it’s flawed. The Race Index doesn’t recognise, reward or promote the aspects of a race that truly support and grow the sport of stand up paddling: mass participation by amateur paddlers, junior participation by the future generation or the quality of an event’s media that is often essential for spreading the word about our sport. Because it powers the World Rankings, the Race Index has an outsized impact on the sport. It’s important we keep evolving the system to ensure that impact is positive. Many athletes chase world ranking points and many events chase inclusion in the world rankings system. So the fact the Race Index was only focusing on elite participation was essentially encouraging race organisers to focus on one narrow aspect of SUP, while it wasn’t enocuraging the athletes to focus on the grassroots events that are the core of our sport. While I’ve made tweaks to the algorithm every year for the past half a decade, this “New” Race Index is by far the biggest change. It fundamentally alters the World Rankings system from an elite-only leaderboard into a truly open platform that welcomes all paddlers and encourages all events to focus on what really matters. The old SUP Racer World Rankings only showed the top 100 men and top 50 women, while the system only promoted the 20-25 “most elite” races of the year. In contrast, this new system will probably rank at least three thousand paddlers in Season 2019, while I estimate around 100-150 races will be recognised. You can be on the same leaderboard as Lincoln Dews and Sonni Honscheid even if you only compete locally. The system will still be an accurate ranking of the world’s best paddlers – the world number one will still be the best athlete of the year – but now it’s also going to be a leaderboard for all paddlers. At least that’s what I’m aiming for. I’m not making any promises, but I am excited to see what this new system can do: The basic mantra behind the New Race Index is that every paddler can be part of the World Rankings, because every paddler is part of the sport. The Race Index already rewards a lot of great races that support our sport. The “majors” such as Carolina and the Gorge, for example. That won’t change, and I expect those two events will stay right up near the top of this year’s Index (which in turn will give them a big influence on the World Rankings). But many events that have been either undervalued or completely ignored will now get a boost. Where was Chattajack last year, for example? That event sells out 500 entries in less than 24 hours yet it’s not even on the radar of the Race Index. Larry Cain shouldn’t be world number one just because he wins Chattajack, but Larry Cain should be ranked higher for winning Chattajack. And more importantly: Chattajack definitely should be recognised and promoted because it’s doing such a good job for our sport. It won’t suddenly rank as high as Carolina, but at least now it will rank. Same with the Hanohano Race in California, the GlaGla Race in France, the Aloha Spirit Festival in Brazil and many more races that have either been on the fringe of the system or completely ignored by it. Plus a lot of top athletes chase world ranking points, so I’m hoping one of the side effects of the New Race Index is that it encourages pro paddlers to support the grassroots events even more. The Paddle League (the new home of the original SUP Racer World Rankings) will see a few other changes in addition to the New Race Index. The League will be more inclusive than it was in 2018: We’ll now recognise all events around the world that fit the basic criteria no matter which federation, tour or series it’s aligned with. The core Paddle League events will still be the ones we heavily promote, but all events around the world can now potentially be part of the World Rankings system. We’re also going to launch new ‘Regional Leagues’ and ‘Specialty Leagues’ under The Paddle League banner to help shine even more of a spotlight on different parts of the sport, while new “Masters” and “Junior World Rankings” will hopefully help motivate and excite different parts of the community. The Paddle League aims to be a truly open, unified platform to help grow the sport and push things forward for everyone in the community, something you’ll hear more about next week. And at the core of The League is this New Race Index. So that’s the basic story. The New Race Index. A new way to power the World Rankings and hopefully a new way to help the sport grow. The New Race Index will still score events from 0-100%, just like the old system. And just like the old system, an event’s Index score determines how many world ranking points are on offer to athletes. For example, a 60% race rewards the winner with 60.00 world ranking points. And because the main role of the Race Index is to power the World Rankings, which we still want to be an accurate reflection of the world’s top paddlers, the “Elite Index” will still have a large influence to ensure top athletes are getting the points they deserve. Races like Hanohano will definitely get a boost from the New Race Index, but unless they suddenly attract a lot more top-ranked paddlers they won’t count for as many points as the majors. Basically we’re just adding three new “bonus” elements to the old formula. This is the same old Elite Race Index we’ve been using the past half a decade, based on how many of the top 50 athletes are standing on the start line. It shows exactly how competitive the field is, and it will still be the core of the new system to ensure an accurate leaderboard. This is the main addition to the New Race Index. Without a doubt, the mass participation grassroots races are what’s driving our sport forward. Whether it’s GlaGla, Chattajack or the dozens of other “mass start” races around the world, these events should be recognised, rewarded and promoted. So from now on, events will score a bonus based on the total participation of the SUP divisions. The more people an event encourages to get on the water, the bigger reward it’ll receive on the Race Index. We hope this will be a small way to encourage event organisers to focus on the open divisions first and foremost. The kids are the future, and we want every SUP race in the world to provide a junior event whenever it’s logistically possible (and safe) to do so. To encourage this, and to recognise the events that are supporting the future, we’re providing what is essentially a “1-star” bonus to any event that hosts a kids’ race. So for example, if Connor Baxter wins the Gorge Paddle Challenge this year, he’s going to score an additional 10 world ranking points because he just won an event that’s supporting the sport by supporting the future. A race is only as good as its coverage. Unless you’re there, you really only experience a SUP event through good media coverage. So in that regard, a SUP race is kind of like a tree falling in the woods: If nobody on the outside hears about it, did it even happen? That’s obviously a stretch, but my point is that while getting 200 paddlers on the water is a great start, if nobody sees photos or video, if there’s no live stream, if there’s no results or race report posted, it’s not really having a huge impact on the sport — the event isn’t contributing to the growth of the sport as much as it could be. So that’s why we’re introducing another 1-star bonus for events that do a great job with media coverage. This will be focused on live streams but will also recognise any event that has a quality media output and therefore helps “spread the word” and grow the sport. This element is more subjective than the other three, but the basic purpose is we’ll reward events that are doing a great job to promote the sport. While the score could theoretically go up to 150% (100% for elite, 30% for mass start and another 10% for both “The Future” and “Spread the Word”), events will be capped at a score of 100 to keep things simple and relatively easy to understand. For context, I expect most big international events will score between 50 and 70% on the New Index, whereas the average was around 20-40% last year. One or two races will probably reach 100-point “unicorn” status this year, but they’ll be the outliers. Carolina and the Gorge are the most-likely candidates, while the big EuroTour stops such as Bilbao along with November’s Aloha Spirit Festival in Brazil are also in with a shot. 2. These new “bonus” elements don’t go as high as the purely Elite Index, which may sound contradictory after my grand introduction to this article. But the Race Index still has to power the World Rankings, and the World Rankings still has to be accurate, so the elite participation is still the core. The New Race Index isn’t about changing who’s ranked in the top 10, it’s simply about opening up the world rankings to every single paddler while supporting events that support the sport. Athletes will always get more points for beating top ranked paddlers. Though on the flipside, it will be much easier for events to score the “bonus” points than increasing the traditional Elite Index. So I expect these new criteria will make up more than half the score of many events. For example, the GlaGla Race will probably be a six-star (60%) race next January due to its massive “mass start,” whereas the old system would have pegged it at about 20% because it only attracts a dozen international athletes. In other words, these mass participation races could end up scoring two-thirds of their score on the New Race Index from bonus points alone. The increase for an event like Chattajack from these three new bonuses will be even more significant. That event never ranked at all, yet now it’ll probably be a 4-5 star race. 3. “SPECIALTY EVENTS” will exist in the system. There are some fantastic races out there that deserve respect and attention (and world ranking points) but simply don’t fit our criteria. Molokai is an obvious example: It would be crazy to encourage 9-year-olds (or even your average weekend warrior) to paddle across the Ka’iwi Channel, yet it’s probably the most prestigious and storied event in our sport. It deserves to be one of the majors. The 11 City Tour is another example. These events will be very few and far between (I can’t think of more than two or three), and they’ll have set scores instead of being ranked on the Index formula (because otherwise they’d be massively under-scored). On a side note: These kind of specialty events add incredible storylines to our sport, which is something I think we should all focus on a lot more. For a sport where the average speed is 10km/h, what’s going to make us interesting to the outside world is rich and engaging storylines, not in-your-face action. I want to chat a lot more about the importance of storylines in SUP but I’ll save that for another post. 4. Which events will qualify for the 2019 World Rankings? An event needs to score at least 20% on the New Race Index to count towards the World Rankings OR it simply needs to be part of an existing, recognised tour, such as the EuroTour or one of the man new Regional and specialty Leagues that we’ll be launching under The Paddle League banner soon. This is partly about quality (we still want events to have to work hard for inclusion) but mainly about management. If we counted every single race in the world that ticked one of the criteria above, I estimate we’d be including about 600 races in the world rankings database. That’s ain’t happening. Under this new system, I expect The Paddle League will recognise about 130 races in Season 2019. 5. As mentioned earlier, The Paddle League World Rankings will now be recognising all international races this year, not just the Paddle League-promoted stops like we did last year. We’re doing this for three reasons: We want the World Rankings to be as accurate as possible, we want to support all events that support the sport, and most importantly we want The Paddle League to be an open, unifying force that has an overwhelmingly positive influence. 6. 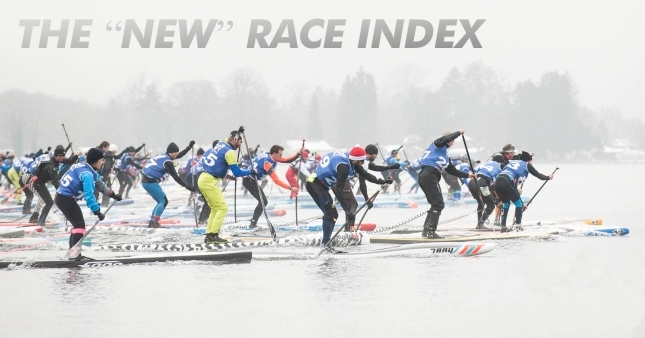 The “New” Race Index will power both The Paddle League World Rankings (the rebranding of the original SUP Racer World Rankings) and several new ‘Regional Leagues’ and ‘Specialty Leagues’ that will be launched this year. The new-look Paddle League (“The Paddle League 2.0”) will be revealed next week. Needless to say, it follows the same ethos of the New Race Index: Promoting stand up paddling as a sport for everyone and recognising all races that support our sport. This is the trickiest part of the whole Race Index system. Do you announce an event’s score ahead of time and hope it becomes a self-fulfilling prophecy or do you leave it as a floating system that makes it harder for athletes to plan their season? In the early days of the SUP Racer World Rankings, nobody had any idea what an event would score until after it was finished. Last year we experimented with a set-points tour on The Paddle League, which had many benefits (easy to follow) but probably drifted too far from the original system. This year will be somewhere in between. The New Race Index will use a floating system, meaning an event won’t be guaranteed a score until we see how many paddlers are on the start line (both pro and amateur). But we already know roughly what each event will score this year, so in the next two weeks we’ll release a “Season 2019” guide that provides an “Index Estimate” showing which events are likely going to score what. 8. Nothing is set in stone here. I don’t plan on moving the goalposts mid-season, but we’ll definitely evaluate the New Race Index in December and probably tweak some things before the 2020 season. We’ll release the first version of the 2019 rankings after the major Air France Paddle Festival in Tahiti in early April. After that, the aim is to update the rankings each week (presuming there’s a race somewhere in the world that qualifies, which there probably will be during peak season from May to August). The system will now run from January to December, and it’ll be reset each year to give the season more clarity (unlike the old SUP Racer system that used a rolling 12 month leaderboard). 10. Finally, let’s have some fun! Hell, I’m getting tired just reading everything I read above. It’s a lot to take in, but the simple idea is this: We want to support the events that support the sport, and we want stand up paddling to be a sport for everyone. The algorithm can be complex but the output is simple: Events that do more to support the sport will rank higher on the Race Index, which will give them a bigger influence over the World Rankings. Simple. Comments/questions? Hit up the original Facebook thread.